The King Georgian Court with its King Canopy bed and private bath is comfortable and inviting. Enjoy one of Our Classic Victorian Afternoon Teas...for 20 or more Guests Reservations Necessary . "There are few hours in life more agreeable than the hour dedicated to the ceremony known as afternoon tea." 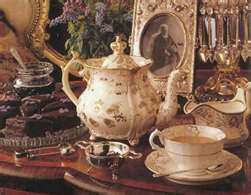 - Henry James ( 1843-1916) Welcome to our Afternoon Tea. We are pleased to have you join us. Go back in time to a legacy of a formal tea ceremony. The taking of tea gives you a time of relaxation and enjoyment of special treats that are often lost in the shuffle of life's rush. Make a reservation for tea in our 18th Century English Chippendale Dining Room with fine china, linens and silver. Or choose to have tea in our Library, fireside, with some friends, in the colder months. You may have a tea with less than 20 with a one night stay if you wish. 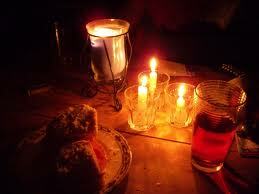 iNTIMATE Tea for two fireside $70. 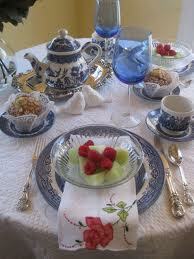 Unlimited Tea.....Fresh Fruit plate, fruit chiffon or soup. 3 tea sandwhiches, Salad, and Sweets . Select from our FiveCourse Menu.... 3 hour event We look forward to having the opportunity to serve you . $22.95 per person plus tax and gratuity 20 people min.